I got a lot of emails asking for more Sammy, so since I usually (well, at least “often”) aim to please, here y’all go. Note that whoever took the trouble to clip this out and paste it into a book did not also make sure to date it. (Don’t do that!) Context tells me, though, that this was written in the fall of 1955. 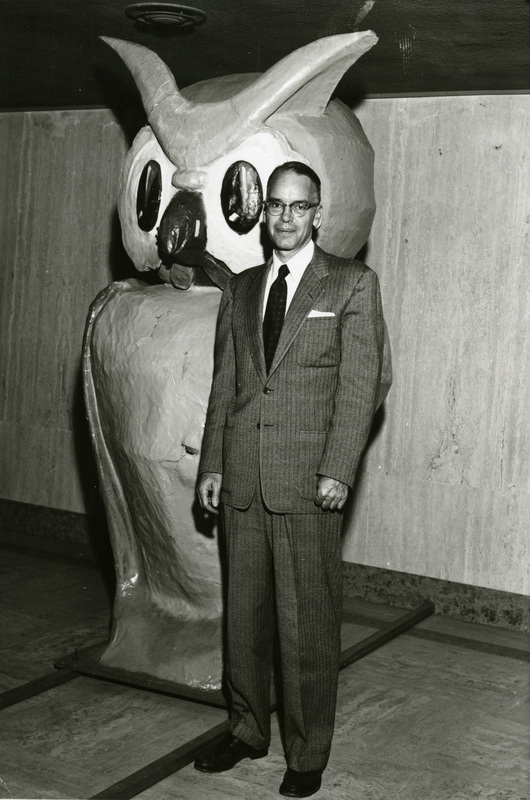 You can see that it’s the owl pictured with Hardin Craig, suggesting that that image was the earlier one. 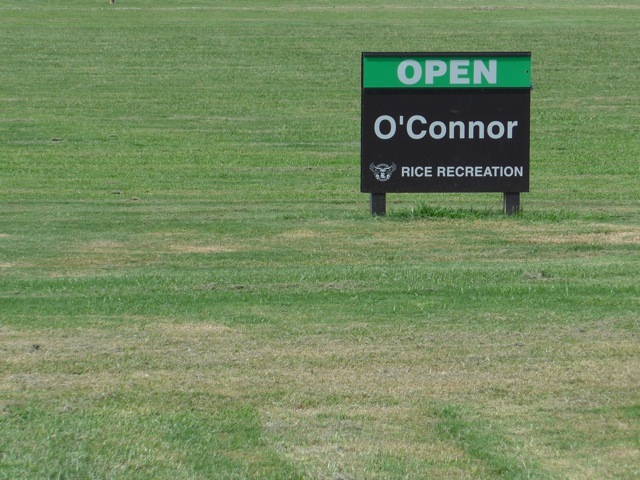 I still don’t know the whole story (is this the same owl that was stolen by some Aggies and painted maroon and white?) but knowing this date will make it possible to figure more of it out. Was the stolen Sammy ever recovered? Rice had a big fiberglass Sammy in the early/mid 1970’s that was kept on the sideline at football games. 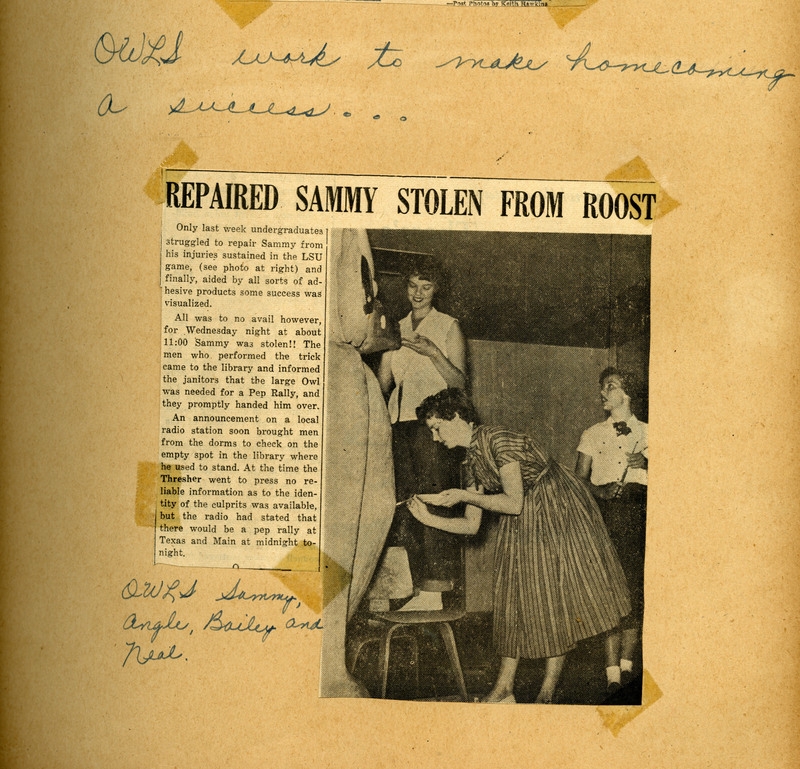 (Freshmen used to “owl bow” toward Sammy in the 1960’s and early 1970’s.) I have a picture of Sammy in our room (Hanszen new section) from 1975 that I will send to Melissa. That fiberglass Sammy resided at the top of the Section 1 stairwell in the Old Tower of Hanszen in 1971. He was indeed the subject of the freshman owl-bowing “rite of passage” on the sidelines at the home opener. “OHHHH SAMMY!” A.L. Smith, Ray Ledesma, myself and other frosh were strongly “incentivized” by Dave Ott and others to participate in this abdominal exercise tribute. I remember owl-bowing in either 1976 or 1977 to the large fiberglass Sammy. (My freshman and sophomore years, and I was in Hanszen). Yes, I remember Melissa mentioning “owl bowing” in a previous post. The Sammy in the rear seat of the Bel Air is the one I bowed down to at football games as a slime in the fall of 1958. Not sure what happened to the later incarnation of Sammy that I saw on the sidelines. I’d heard that it was destroyed, but no other details, such as “how”, “why”, or “when”. I can tell you that the year listed for this image is wrong – it has to be at least 7 years off. The uniforms shown in the 76202 image that Grungy cites appear in the 1971 Campanile (pp. 212-3), but different ones are in the 1969 edition (sorry, no page numbers). 64081 can be dated to 1958 – the beanies have ’62 on them, my class. I don’t recognize anyone except the cheerleader, Margie Moore. The slimes are probably from Hanszen (whose beanies were light blue) or Wiess (yellow). Note that the upper deck of the stadium is full. You can just see an Aggie yell leader between Sammy and the student to the right, so this was Nov. 15, 1958. We lost. 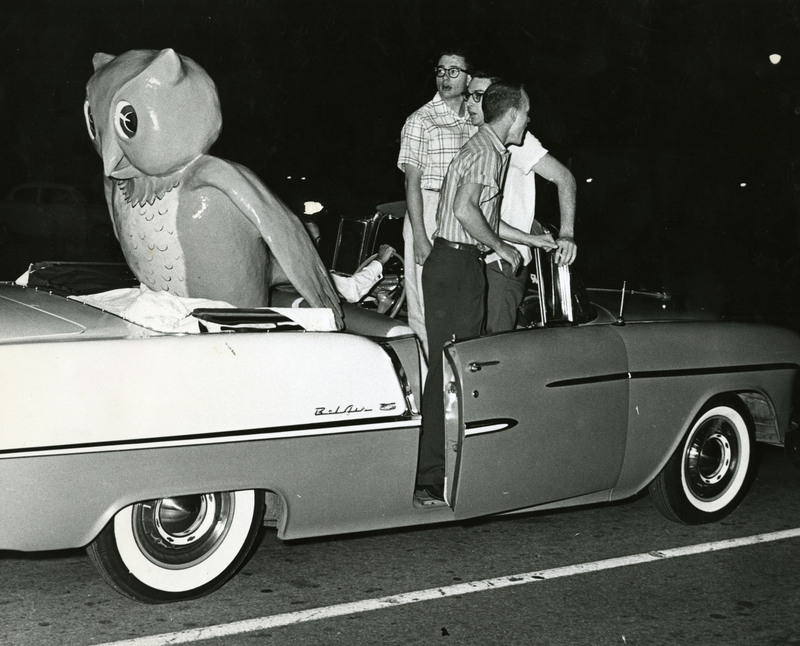 I’ve heard that Sammy, the one shown in the convertible, still exists somewhere on campus — possibly in Hanszen. A search project for you, Melissa.